The desire to recruit and educate a future generation capable of and passionate about conserving New Mexico’s, the nation’s, and the world’s outstanding cultural heritage, while creating new regionally-responsive design, led to the creation of the University of New Mexico’s School of Architecture and Planning‘s program in Historic Preservation and Regionalism (HPR). By engaging contemporary design and planning movements, the university’s program strives to foster economic development and enhance the quality of life in local communities while contributing to the conservation of our architecture. 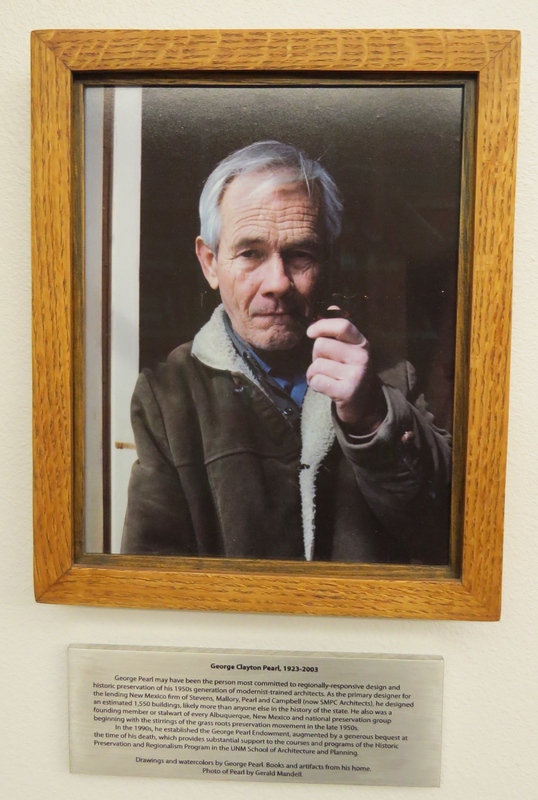 Photo of George Pearl on display in the George Pearl Library at UNM. A leader of this regionally-responsive design and historic preservation movement was George Clayton Pearl (1923-2003), one of Albuquerque’s most prolific architects. As the primary designer for the New Mexico firm of Stevens, Mallory, Pearl and Campbell (now SMPC Architects), he designed an estimated 1,550 buildings, likely more than anyone else in the history of the state. He also was a founding member or instigator of numerous groups that led to the grassroots preservation movement in the late 1950s. Read more about George Pearl’s influence and major projects. In the 1990s, Pearl established the George Pearl Endowment, augmented by a generous bequest at the time of his death to provide support to the courses and programs of UNM’s Historic Preservation and Regionalism Program. UNM recognized Pearl’s many contributions by naming the new home of the School of Architecture and Planning, and of the Fine Arts and Design Library, George Pearl Hall once it was completed in 2007. To further recognize his influence, two George Pearl Fellowships were established in 2004 with matching funds from the New Mexico Legislature. Pearl Fellows are selected from distinguished professionals and educators in preservation, landscape architecture, planning, and architecture. In addition to presenting a public lecture, the fellows also typically contribute to the intellectual life of the school through a short course, design workshop, or other program. 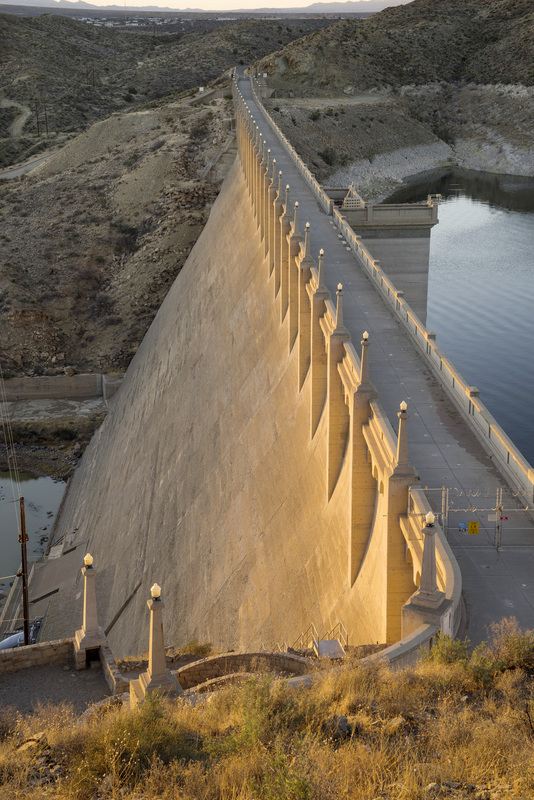 Martin Stupich photo of Elephant Butte Dam. Martin Stupich, fine art photographer and Foundation member, is a recipient of the 2015 George Pearl Fellowship in preservation and regionalism. On March 2, Stupich delivered his lecture, “Cameraman Obscura: Forty Years Sneaking Around In Broad Daylight,” which highlighted four decades of client-driven historical documentation. An industrial landscape photographer, during his career Stupich received grants from the National Endowment for the Arts, held jobs with the Department of the Interior, and documented sites from Panama to Puget Sound for the Army Corps of Engineers. His photographs of Cape Canaveral launch pads hang in galleries in Tokyo, while his industrial panoramas reside in official state archives. “I’ve been inspired by my many mentors in their raw, spectacular observation,” said Stupich. “I try to withhold my judgment wherever I go and capture that same objective observation,” he said about his photography. ← Share our love of New Mexico architecture: Become a member today! excellent article! I am a student in the preservation and refinalism program at UNM. it has shaped my scholarship, interests and community commitments beyond measure. it is both a graduate certificate and professional certificate program. I would encourage anyone who area about the historic buildings, districts, landscapes and artifacts to consider a class. thanks for a great artcle! I caught Marty”s talk a few weeks ago. it was inspiring, funny, poignant, deeply felt and inspiring. I was honored to be in attendance.